The Corporate (or Corporation) level is used to manage settings that affect multiple locations, such as separate retail stores, hotels, or restaurants. The Location level is used to manage employee schedules and attendance at a specific location. When operated by a business with more than one location, some of the functionality of TimeForge is moved to the Corporate level to ensure consistent labor reports and pay rules across all business locations. The Corporate level is used to manage settings that affect multiple business locations, such as company-wide Positions, Departments, and Leave Types. How do I know if I’m at the Corporate Level? How do I get to the Corporate Level? 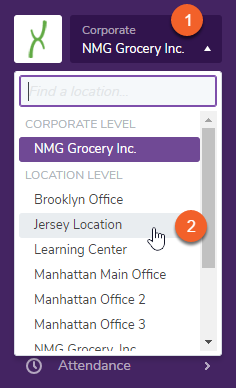 Simply click the top of the navigation pane to open up the menu, then select the name of your business under CORPORATE LEVEL. Adding more locations to TimeForge is easy! Learn how. The Location level is used to manage labor at a specific location, including employee schedules and attendance. How do I know if I’m at the Location level? When you’re at the Location level and operating with multiple locations inside of TimeForge, you will see the word “Location” followed by the name of your currently-selected location. 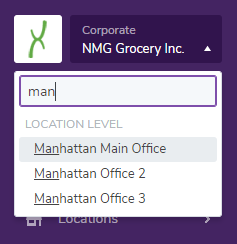 Locations in need of manager attention will be displayed with an asterisk next to their name, indicating shift swaps or employee requests that are pending. How do I get to the Location Level? 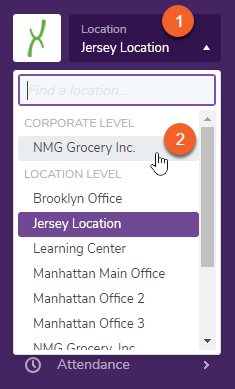 Simply click the top of the navigation pane to open up the menu, then select the name of a location under LOCATION LEVEL.